New maps published in late June highlight future acreage release areas that will open for competitive bidding rounds for oil and gas prospectors from 2018 to 2021. The maps will also advise stakeholders of areas that are not available for Special Prospecting Authority with an Acreage Option applications. The WA Government is encouraging competitive bidding, which is the Department of Mines and Petroleum’s preferred mechanism for industry to acquire an exploration title for petroleum. Acreage release schedules will be updated at least once a year and when significant amounts of new prospectivity data or acreage become available to warrant a review. 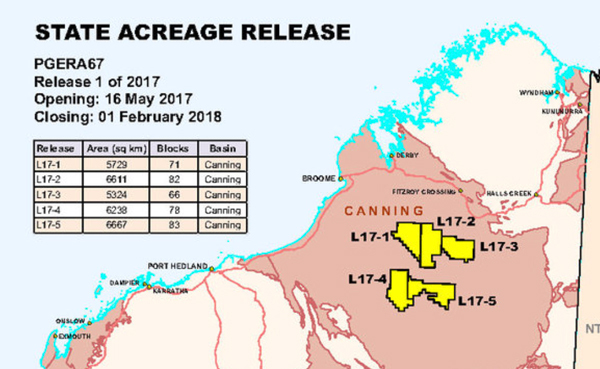 The industry is encouraged to nominate specific areas for acreage release, which will be considered the year it is nominated.